Although I am a geek, I’m not a scientist and this book was really geared more towards chemistry majors as much of it went above my head. That being said, what I did understand was fascinating. If you like Alton Brown you’ll love this book because it takes that scientific approach to cooking to the next level. Presented like a computer manual, each chapter examines a function of cooking such as the hardware, software, variables and methods involved. In these chapters celebrities and food luminaries are interviewed for their unique perspective on the subject and recipes demonstrating the concepts are also included. The book is densely packed with information and if you understand college chemistry and physics you’ll get much more out of this book then I did because I struggled remembering the details of chemical bonds and Kelvin. Even with those limits, I still struggled with the onslaught of information explaining different tasting patterns and flavor combinations and had to read some chapters more than once. This isn’t light fluffy reading but it’s really worth it in the end. 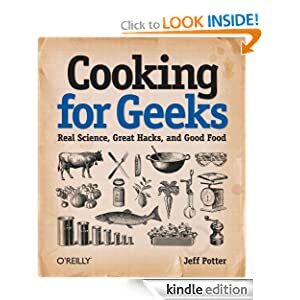 After this book I was much more empowered to experiment with my cooking and cooking methods and understand why I like certain foods, combinations and cooking methods and why I dislike others. This is the science behind the art of cooking.